What is your E-Prep “End Game?” Seriously! Do you know? When you go on a trip, you typically have a destination. You are driving to a national park or Disney Land or flying to visit your sister, right? If you didn’t know where you were going, you’d have a hard time getting there! Emergency preparedness is similar. You need an end game. You need a goal. 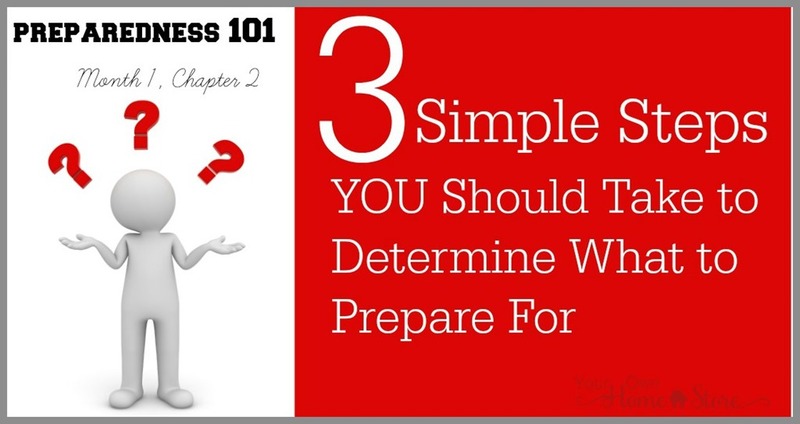 Are you trying to prepare for everything and anything? That sounds stressful! Please don’t do that to yourself! The truth is, it is very, very unlikely that you will face every single possible disaster in your lifetime. Trying to prepare for them all at once is a waste of time and energy. Instead, give some serious thought to what you and your family should prepared for. 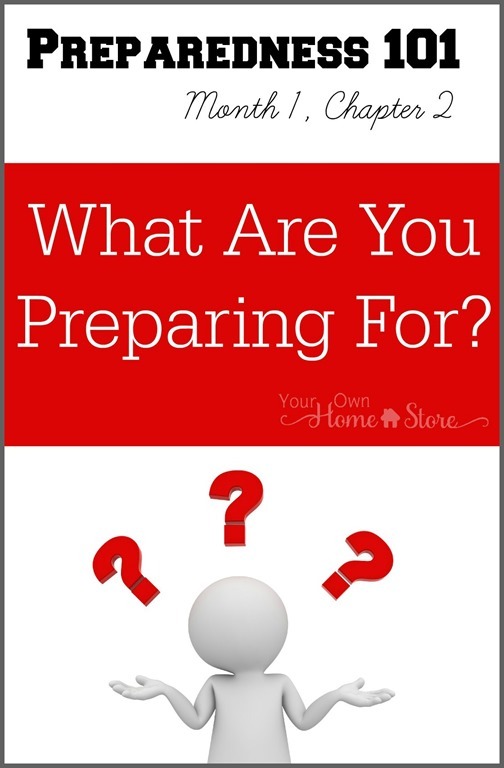 This is step #1 in creating your family’s personal preparedness plan. 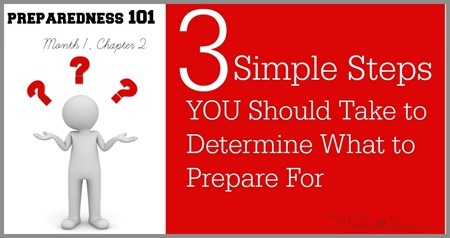 I’m going to give you three simple, helpful steps you can take today that will bake all your “prepping” efforts a bit more effective and focused. Before I start, I want to offer a word of caution. This blog has never been, and never will be fear focused! What I am about to suggest may cause you some anxiety as you think of all the possible scenarios you could ever face. Please don’t let it. While it is a certainty that not everything will go perfectly right in your life and you will have to deal with some hiccups, it is also a certainty that not everything will go terribly wrong. You will not have to deal with / face every possible disaster! Please let this exercise decrease your anxiety by knowing that you are preparing for the most important things first! Sounds simple enough, right? It is. It should only take a few minutes! You can do this alone, or have a family brainstorming session with a spouse and / or older kids. Simply make a list of everything that could go wrong in your life. (this is the part that may make you anxious….don’t let it! I can guarantee that not ALL of these things will happen to you). List anything and everything from small everyday emergencies to large scale disasters. You can likely think of more….large and small. Write them all down and don’t forget to breathe calmly and not freak out. There is NO WAY all of these things will happen to you! Likelihood: How likely is this to happen to you? Frequency: How often could this happen to you? Effect: How seriously would this change your life if it did happen? Use this website to see if you live near nuclear plants, evacuation zones, faults, tectonic boundaries etc (click on layers at the top right of the map to choose your disaster). Find a list of dams in the US here. Add the three numbers you gave to each item on your list. You should come up with a number between 3-12 for each item. Now, write your list down in order of the highest total number to the smallest. Those at the top are those you should work towards preparing for / planning for first. Those at the bottom are things you shouldn’t spend time / effort worrying about! If it is helpful, I’ve created a to help you with this. It has all the disasters I’ve listed above, plus space for you to add your own ideas. Simply click HERE or on the image below to download it. As you move on this month with creating a preparedness plan for your family, you now have a concrete place of where to start. I will work on these, but not until those top 5 are covered. And it is likely that by preparing for those top five, I will be more prepared for everything on the list. So as not to feel overwhelmed, I like to divide up preparedness more like immediate evacuation (like nuc plants, chem spills), planned evacuation (hurricanes), and shelter in place (that could include civil unrest, power outage, water contam, etc). In emergency preparedness work, it is called “All Hazards” type planning. Another option for sure Lori! Thanks! 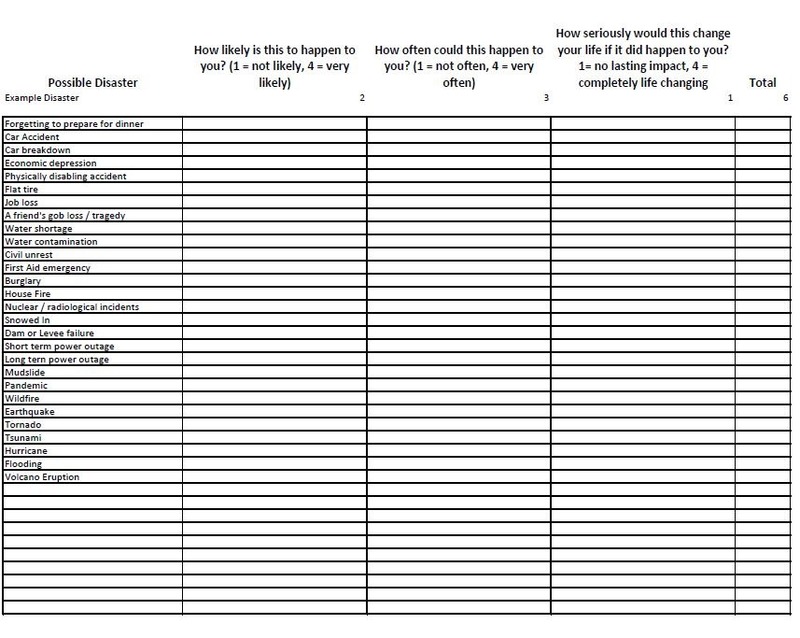 We’ll done on creating an easy to use rating scale for one’senate preparedness priorities. It can be overwhelming to think about prepping for every possible disaster when in reality we need to best prepare a plan and a process that enables our continuity rather than attempting to mitigate emergencies on a disaster by disaster approach. Then it’s a short bridge to compiling the materials and supplies that support your continuity plan…no matter the emergency. Kudos! Do take a bow. What a kind, thoughtful comment Bennett! I appreciate it! Thank you, Misty! I’m sharing this with the Relief Society in my ward. Many blessings for you and your family. Good work! THANK YOU THANK YOU for all your hard work because you help in more ways than could ever tell you!!! GOD BLESS YOU!! !